Sometimes your kid says something so cute that even though it’s incorrect in a couple of ways, you can’t bear to correct her. Lennie is a big big fan of sweet potato casserole. 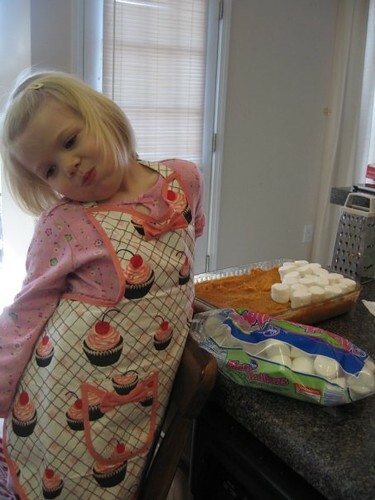 I knew she would be the moment I saw her cramming marshmallows into her mouth when helping to layer them in on top of the sweet potato puree. This seemed to her rather lasagna-like, and she has for a long time called lasagna basagna. It’s not that she can’t make the ell sound. It’s simply that this is how she heard it at some point, and it’s how it stuck. On its own, it’s kind of cute and harmless, but when said with glee and repetitively and with “marshmallow” as a prefix, it’s just the best. When she’s 30 and learns that this stuff isn’t actually called marshmallow basagna, I guess she’ll hate me, but it’s a risk that for now I’m willing to take.